For other people named Richard Griffiths, see Richard Griffiths (disambiguation). Richard Thomas Griffiths OBE (31 July 1947 – 28 March 2013) was an English actor of film, television, and stage. He received the Laurence Olivier Award for Best Actor, the Drama Desk Award for Outstanding Actor in a Play, the Outer Critics Circle Award for Best Featured Actor and the Tony Award for Best Performance by a Leading Actor in a Play, all for his role in The History Boys. For the 2006 film adaptation, Griffiths was nominated for the BAFTA Award for Best Actor in a Leading Role. He was also known for his portrayal of Vernon Dursley in the Harry Potter film series, Uncle Monty in Withnail and I (1987), Dr. Albert Meinheimer in The Naked Gun 2½: The Smell of Fear (1991), Henry Crabbe in Pie in the Sky (1994–1997), Prostetnic Vogon Jeltz in The Hitchhiker's Guide to the Galaxy and King George II in Disney's Pirates of the Caribbean: On Stranger Tides (2011). Earlier in his career, he had a prominent supporting role as British journalist Collins in Richard Attenborough's Academy Award-winning film Gandhi (1982). Griffiths was born in Thornaby-on-Tees, North Riding of Yorkshire, to Jane (née Denmark) and Thomas Griffiths. His father was a steelworker who also fought in pubs for money, while his mother's occupation was described as "bagger". He and his brother John were raised in the Roman Catholic faith. His parents were both deaf, and he learned sign language at an early age in order to communicate with them. During his childhood he attempted to run away from home many times. He dropped out of Our Lady & St Bede School in Stockton-On-Tees at the age of 15  and worked as a porter for Littlewoods for a while, but his boss eventually persuaded him to go back to school. He decided to attend a drama class at Stockton & Billingham College. He continued his education in drama at Manchester Polytechnic School of Drama (present-day Manchester School of Theatre). After graduating, Griffiths won a contract on BBC Radio with their Radio Drama Company. He also worked in small theatres, sometimes acting and sometimes managing. 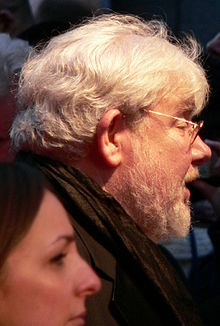 He built up an early reputation as a Shakespearean clown with portrayals of Pompey in Measure for Measure and Bottom in A Midsummer Night's Dream with the Royal Shakespeare Company, and went on to play the Kings in Love's Labour's Lost and in Henry VIII. He eventually settled in Manchester and began to get lead roles in plays. From there, he began to appear on television and then got his big break in film in It Shouldn't Happen to a Vet (1975). By the early 1980s, he was selected for the lead role in Bird of Prey, an early computer-conspiracy thriller. His character Henry Jay was reprised in Bird of Prey 2 (1984). In 1981, he also gave a memorable performance as Chilean secret police victim William Beausire in an edition of the BBC Prisoners of Conscience series. Griffiths went on to supporting roles in a number of major films, including The French Lieutenant's Woman, Chariots of Fire, and Gandhi. On stage, in 1985–86, he performed the role of Verdi in Julian Mitchell's After Aida, in Wales and at the Old Vic Theatre in London. He appeared in The World of Peter Rabbit and Friends. Griffiths' film roles were in both contemporary and period pieces, such as Gorky Park (1983), Withnail and I (1987), King Ralph (1991), The Naked Gun 2½: The Smell of Fear (1991), Guarding Tess (1994) and Sleepy Hollow (1999). Later, he was seen as Harry Potter's cruel uncle Vernon Dursley in the Harry Potter series, appearing in five of the eight films: Philosopher's Stone, Chamber of Secrets, Prisoner of Azkaban, Order of the Phoenix, and Deathly Hallows – Part 1. He appeared as Inspector Henry Crabbe, disillusioned policeman and pie chef extraordinaire, in Pie in the Sky, a role which was created specifically for him. He also made an extended appearance in the 2005 version of Charles Dickens' Bleak House. In 2004, he originated the role of Hector (the teacher) in Alan Bennett's play The History Boys, directed by Nicholas Hytner, winning the 2005 Laurence Olivier Award for Best Actor. During the play's subsequent United States run, he added a Drama Desk Award, an Outer Critics Circle Award, and a Tony Award. He reprised his role in the film version, which was released in October 2006. Together with his Harry Potter co-star Daniel Radcliffe, he appeared in a stage revival of Peter Shaffer's Equus at the Gielgud Theatre in London, and later from October 2008 in a short run of the play at the Broadhurst Theatre on Broadway, which ended in February 2009. Later, in 2009, he replaced Michael Gambon as W.H. Auden prior to the premiere of The Habit of Art at the National Theatre, once again directed by Hytner. Griffiths was considered for the part of the Doctor in Doctor Who, following Tom Baker's departure in 1981, but was unavailable. He was strongly considered once again to take on the role of the Eighth Doctor, had the series continued past 1989. Coincidentally, his two principal co-stars from Withnail and I — Paul McGann and Richard E. Grant — both went on to play the role in some capacity. He performed in adaptations of the Hitchhiker's Guide to the Galaxy, providing the voice for Slartibartfast for the radio adaptation of Life, the Universe and Everything and playing the Vogon Jeltz in the film version of The Hitchhiker's Guide to the Galaxy. He appeared in Bedtime Stories with Adam Sandler and as a special guest in A Muppets Christmas: Letters to Santa. In 2005 he asked a member of the audience to leave a performance of Heroes after her phone rang three times. This interruption of a performance because of audience distraction happened three times in his career. Griffiths appeared as King George II in Disney's Pirates of the Caribbean: On Stranger Tides. He appeared in the first episode of the television series Episodes as Julian Bullard. In April 2012, Griffiths starred, with Danny DeVito, in a revival of the Neil Simon play The Sunshine Boys. The show previewed at the Savoy Theatre from 27 April 2012, opening on 17 May and playing a limited 12-week season until 28 July. Griffiths met Heather Gibson in 1973 and they married in 1980. They had no children. Griffiths was awarded an honorary degree from Teesside University in 2006 and was appointed an Officer of the Order of the British Empire (OBE) in the 2008 New Year Honours. Griffiths died aged 65 at the University Hospital Coventry on 28 March 2013 after complications following heart surgery. He is buried in the graveyard of St Mary the Virgin Church, Bearley, Warwickshire. ^ a b Topping, Alexandra (29 March 2013). "Richard Griffiths, uncle to Withnail and Harry Potter, dies aged 65". The Guardian. Retrieved 29 March 2013. ^ a b "Potter and Withnail actor Richard Griffiths dies". BBC Online. 29 March 2013. Retrieved 29 March 2013. ^ "Richard Griffiths Biography". FilmReference.com. 2008. Retrieved 11 April 2008. ^ a b c d e "Richard Griffiths". Telegraph. 29 March 2013. Retrieved 31 March 2013. ^ Laurence, Charles. "Part 3 of Griffiths interview". Saga Magazine. Archived from the original on 27 September 2007. Retrieved 11 April 2008. ^ a b c "Richard Griffith Dies". Teesside Evening Gazette. Retrieved 29 March 2013. ^ "Alumni profile". The Manchester Metropolitan University School of Theatre web site. ^ Michael Quinn (8 April 2013). "Richard Griffiths". The Stage. Retrieved 24 December 2018. ^ "In pictures: The career of Richard Griffiths". BBC News. 29 March 2013. Retrieved 24 December 2018. ^ a b "THE FULL MONTY". The Independent. 28 June 1997. Retrieved 28 December 2017. ^ Bruce Weber (29 March 2013). "Richard Griffiths, Falstaffian English Actor, Dies at 65". The New York Times. Retrieved 24 December 2018. ^ Oliver Lyttelton (29 March 2013). "R.I.P. 'Withnail & I' And 'Harry Potter' Star Richard Griffiths (1947-2013)". IndieWire. Retrieved 24 December 2018. ^ "Actor Richard Griffiths, Uncle Vernon In 'Harry Potter' Movies, Dies". NPR.org. Retrieved 28 December 2017. ^ Garfield, Simon (9 October 2005). "Richard Griffiths: 'I've always hated the way I look'". The Observer. ISSN 0029-7712. Retrieved 28 December 2017. ^ "Richard Griffiths, Harry Potter Actor, Dies at 65". PEOPLE.com. Retrieved 28 December 2017. ^ Weber, Bruce (29 March 2013). "Richard Griffiths, Falstaffian 'History Boys' Star, Dies at 65". The New York Times. ISSN 0362-4331. Retrieved 28 December 2017. ^ "Equus". London Theatre Guide. 8 June 2016. Retrieved 28 December 2017. ^ Brantley, Ben (25 September 2008). "Daniel Radcliffe and Richard Griffiths in Thea Sharrock's Revival of Peter Shaffer's Drama". The New York Times. ISSN 0362-4331. Retrieved 28 December 2017. ^ Iqbal, Nosheen (2 October 2009). "Michael Gambon bows out of Alan Bennett's The Habit of Art". The Guardian. ISSN 0261-3077. Retrieved 28 December 2017. ^ "BBC Archive: Nearly Who". BBC. ^ "Richard Griffiths BBC profile". Drama Faces. BBC. Archived from the original on 25 August 2006. Retrieved 5 April 2007. ^ 1952-2001., Adams, Douglas, (2005). The hitchhiker's guide to the galaxy radio scripts : the tertiary, quandary and quintessential phases. Maggs, Dirk., Hyman, Bruce., Chattwell, Helen., Above the Title (Firm). London: Pan. ISBN 0330435108. OCLC 58831947. ^ Jem,, Roberts,. The Frood : the authorised and very official history of Douglas Adams & the hitchhiker's guide to the galaxy. London. ISBN 9780099590767. OCLC 920836076. ^ "Bedtime Stories". TVGuide.com. Retrieved 28 December 2017. ^ "It's gonna be a green Muppets Christmas". The Hollywood Reporter. Retrieved 28 December 2017. ^ "Actor snaps over ring mobile". BBC News. 22 November 2005. Retrieved 22 April 2007. ^ Burkeman, Oliver (30 September 2006). "A break in the clouds". The Guardian. London. Retrieved 22 May 2010. ^ "Exclusive: Pirates 4 News From Rush". Empireonline.com. Retrieved 29 June 2012. ^ Desk, TV News. "Richard Griffiths Joins LeBlanc & Mangan In Showtime/BBC's 'Episodes'". Retrieved 28 December 2017. ^ Kemp, Stuart. "Danny DeVito to Make West End Debut in 'The Sunshine Boys'". The Hollywood Reporter. ^ Farndale, Nigel (25 February 2007). "Big unfriendly giant". The Telegraph. Retrieved 29 March 2013. ^ "New Years Honours List". BBC News. 29 December 2007. Retrieved 29 June 2012. ^ "Potter and Withnail actor Richard Griffiths dies". BBC News. BBC. 29 March 2013. Retrieved 29 March 2013. ^ "PG Wodehouse - Plum - Bookmark - BBC Documentary - 1989". BBC2. Retrieved 14 November 2015. ^ "BFI – ARCHIBALD THE KOALA 04/09/98". British Film Institute. Retrieved 14 September 2009.